Australia’s greatest natural bodybuilders gathered to compete in the 2004 Musclemania Australia – part of the huge 2004 FAME Australia event. The elite Open Gold Division was won by a superbly muscled Warren Clampit. 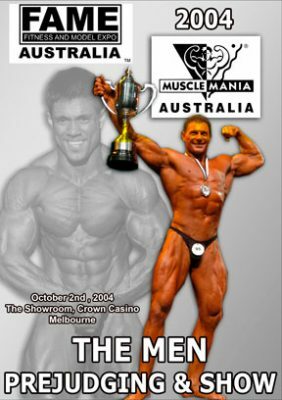 Australia’s greatest natural bodybuilders gathered at the Showroom, Crown Casino, Melbourne on Saturday 2nd October to compete in the 2004 Musclemania Australia – part of the huge 2004 FAME Australia event. The elite Men’s Open Gold Division was won by a superbly muscled Warren Clampit.